The rise of terrorism and transnational crime has been seen to increase dramatically in the past decade. No longer entirely political or revolutionary in purpose, some kidnappers are simply concerned with financial gain. Travel Warnings are issued when the State Department recommends that Americans avoid a certain country. They also issue Consular Information Sheets for every country of the world with information on such matters as the health conditions, crime, unusual currency or entry requirements, any areas of instability, and the location of the nearest U.S. embassy or consulate in the subject country. Do You Know Anti-Terrorism Laws? BBC News explains the basics behind anti-terrorism laws - and why some people say they are controversial. Read articles from the leading academic institute for counter-terrorism in the world, the International Institute for Counter-Terrorism (ICT). These articles provide expertise and insight into the global struggle against terrorism. What Do The Colors Really Mean? Visit the Department of Homeland Security's Official Website and download this one-page guide with recommended actions for each level. The rise of terrorism and transnational crime has been seen to increase dramatically in the past decade. No longer entirely political or revolutionary in purpose, some kidnappers are simply concerned with financial gain. To them, it is just a business. This growing phenomenon increases the percentage of incident probability in respect of kidnapping and extortion and creates a unique need for coverage that had previously been unavailable or else prohibitively costly. Kidnap, ransom and extortion (K&R) are not just economic crimes. The human, real and material costs to individuals, corporations, media & NGO groups are great. The impact on employees, families & the persons who are directly involved, can be shattering. Our clients include multinational corporations operating in high risk regions of the world, financial institutions, key executives working in the individuals whose wealth or fame may attract the attention of criminals. Such clients include financially prominent families, heads of large corporations, media, NGO personnel and celebrities, at home and abroad. Our consultants have considerable experience in dealing with K&R cases, particularly within the Middle East, Asia, South and Central America. This is our business, we are able to dictate the pace, and so regain the initiative in these incidents. We ensure that a client is guided through every stage of the negotiation process through to the resolution, ensuring that the client is able to evaluate the information through the duration of the crisis and so able to make sound decisions under extremely difficult circumstances, with our support. Optional briefings and training sessions giving advice and practical methods for avoiding an incident, or how to cope in captivity, are available to all clients and should be sought by those living in, or traveling to, high risk countries and cities. Kidnapping is on a rise, yet only 60 percent of Fortune 500 companies, carry K&R insurance. This trend is now changing, with insurance underwriters and the individuals themselves, now requiring that K&R services be included within the terms and conditions of their employment. · Bodyguard or Close Protection Team, provided as part of the agreed policy, to ensure security of family members and other personnel, throughout the duration of the incident. 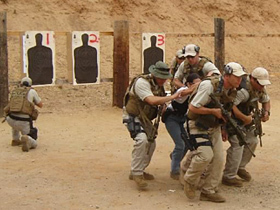 · Hostage Retrieval Teams (HRT), trained in K&R, hostage rescue and extraction. Available on 24 hour call, to facilitate the safe collection and return of persons following successful negotiations, or else acting upon the decision of family members and local agencies, to extract kidnap victim(s) and transport them to a safe location. Our HRT personnel are all specialists, with operational and training expertise within HRT formations such as the SAS, ABA, US Navy SEALS, Delta, DEA, FRI or Police SWAT. The following countries are listed as being the locations where kidnapping most frequently occurs. Persons traveling to these locations, should consider kidnap and ransom insurance, also the services of a bodyguard or close protection team, as good business sense. That said, there have been numerous recent cases in the USA and U for example, where plans to kidnap the children of high profile persons have been uncovered. K&R is not a luxury service, it is increasingly being seen as a sensible precaution. Increasingly, any high profile, high net work or key person, can be the target of a kidnap, ransom or extortion incident, anywhere in the world, including in their home nation. Be prepared and rest assured that if the worst does happen, then you, your family and organization will receive the immediate care, attention and services required to protect, secure and return our client. Contact us to discus your individual requirements. You are assured of the highest quality service tailored to your needs, also our closest confidential attention at all times. Copyright © 1997 - 2017 Matcal International Security Service - All Rights Reserved.